A quick rundown of the voice recognition specialist. Nuance's Dragon software gives PC users the ability to control their machines using their voice. Image Source: Nuance. Even if you've never heard of Nuance Communications (NASDAQ:NUAN), you're probably intimately familiar with its technology. Nuance is a leader in speech recognition software -- its technology powers Apple's digital personal assistant, Siri, for example, as well as the voice recognition services offered in many modern cars. But there's more to Nuance than that. In the next five minutes, you'll gain the knowledge you need to assess the company and the trends affecting its business. Nuance breaks its business down into four segments: healthcare, mobile and consumer, enterprise, and imaging. Nuance's voice recognition technology plays a key role in most of its operations, but it offers other types of software as well. Its imaging segment, for example, is primarily composed of applications that make it easy for professionals to organize, search, and manage documents. Power PDF converts paper files into searchable PDFs, and PDFs into Microsoft Office files. Nuance also works with printer manufacturers, and sells software that lets companies manage complex print queues. In its fiscal year 2015, Nuance's imaging business brought in 12% of its revenue, making it the company's smallest segment. Nuance's enterprise business is its second-smallest segment, generating 17.6% of its revenue last year. Here, Nuance leverages it voice recognition technology to provide services to businesses with large customer service needs. If you've ever called a customer support number and found yourself speaking to an automated system, you may have used Nuance's technology. Nuance's mobile and consumer segment may be the one most familiar to investors. Nuance provides the voice recognition technology that underpins many digital personal assistants, including Siri and Ford's Sync. Nuance's Dragon software lets consumers control their PCs and mobile devices using voice commands. Nuance also owns Swype, a popular third-party keyboard for mobile devices. In total, these offerings brought in 23% of Nuance's revenue in fiscal 2015. The remaining 47.4% came from Nuance's healthcare business. Nuance combines its voice recognition technology with its image tools, offering a variety of products aimed at healthcare professionals that allow them to dictate patient information and streamline medical records. More than 500,000 medical professionals use Nuance's products in some capacity. Nuance's mobile and consumer segment saw the most growth in fiscal year 2015, with sales rising about 3% on an annual basis. Enterprise experienced the most significant decline, with sales dropping nearly 5% on an annual basis. Demand for Nuance's healthcare and imaging products remained roughly flat. Nuance hasn't been profitable for the last few years, which makes it impossible to value under many traditional metrics, such as trailing price-to-earnings ratio. In its fiscal year 2015, Nuance lost $115 million, and last quarter, Nuance lost $12.1 million. Notably, those losses are down from fiscal year 2014 and the first quarter of 2015, when it lost $150.3 million and $50.5 million, respectively. 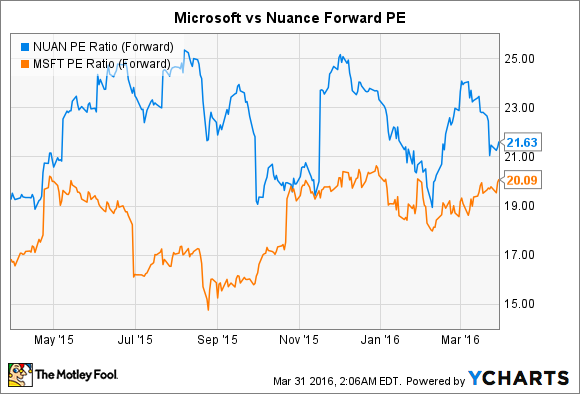 On a forward price-to-earnings basis, which is based on analyst estimates, Nuance trades with a multiple of 21.63. Nuance has no direct competitors of similar size and scope, making it difficult to compare, but Microsoft competes with it in the voice recognition technology space. The Windows giant trades with a forward P/E of around 20. Nuance is a smaller player in the technology space, with a market cap of around $5.6 billion and an enterprise value of $7.17 billion. Nuance has long been viewed as a potential takeover target, and while it would be unwise to base investment decisions strictly on the chance a firm will be acquired, Nuance's assets do appear appealing in a world increasingly dominated by voice recognition and digital personal assistants.